With this week's release of "The Batman Chronicles" Vol. 9 DC adds another book to their growing collection of Batman's earliest adventures. 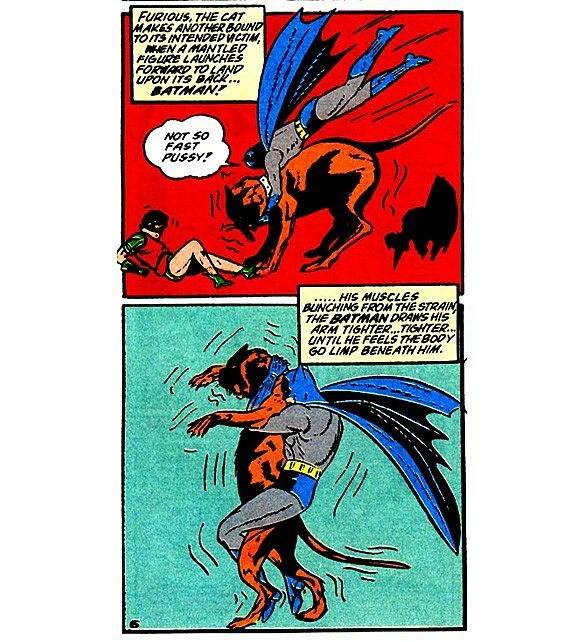 While these stories are certainly valuable in a historic context -- and if you want to see Batman making a lot of jokes while he cold punches suckers in the mouth, which we do -- they, like most of the stories from the '30s and '40s, can often be hard to read. Being produced at the dawn of the medium, they tend to be very repetitive and lack the more sophisticated storytelling that would come to comics with time. And yet, we've read every volume. Why? Because they make up for it by being completely insane. 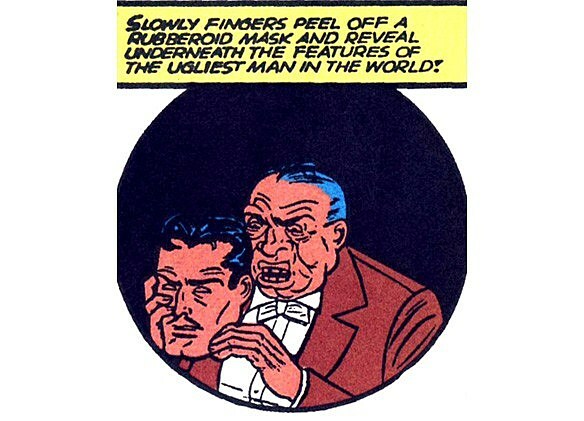 And to give you a taste of just how crazy they get, we've gotten ComicsAlliance staffer and professional Batmanologist Chris Sims to take a look at some of the Golden Age Batman's Strangest Moments! While the Batarang appeared pretty early on, the early years saw Batman experimenting with different "calling cards" to leave at the scene of his exploits to strike fear into the hearts of criminals. Our favorite? That time that he sent his target a live bat through the mail, then waited outside his house until he opened it so that he could throw a dart through the window and kill the bat, all to make a point. That point? That Batman is crazy and he is going to mess you up. 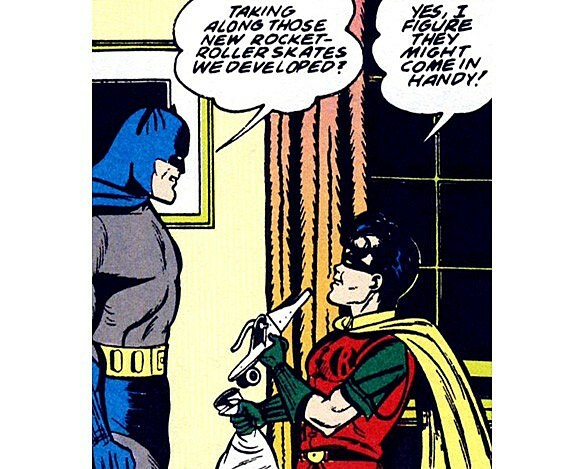 Batman's sci-fi tinged adventures are usually considered to be a trademark of the '50s, but as early as 1940, Batman and Robin took a trip to "The Fourth Dimension" in an adventure that riffed on "Gulliver's Travels." In an attempt to save a race of tiny people from a race of giants, Batman found himself trapped in a "Jack and the Beanstalk"-esque castle, escaping by wrestling a giant cat into submission, making him tap out to the dreaded Bat-Full-Nelson. Despite the fact that he seemed to fight the Joker in every single issue of "Batman" produced in the Golden Age, the Dark Knight&apos;s Rogues Gallery took a while to fill out with the familiar faces we know today. The march of time left plenty of one-off villains in the dust, including The Ugliest Man in the World, whose diabolical plot to rob Gotham City&apos;s socialites of their beauty with a chemical injection was thwarted when Batman was able to invent a cure for ugly. 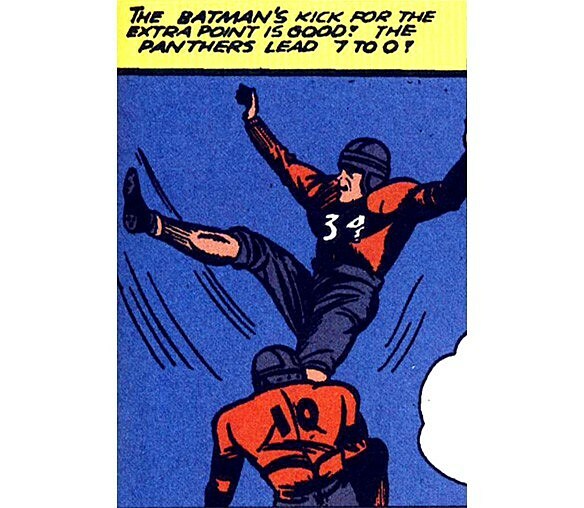 The idea of a super-hero taking the place of a sports hero to thwart gambling wasn't that odd for the '40s--in fact, there's a Golden Age Superman story that's pretty much exactly like this one--but there's just something about the narration that grabs our attention, as it provides a play-by-play for the crimefighter's football skills. Phrases like "Down the field streaks the Batman, weaving in and out of the opposition in a perfect example of broken field running" just crack us right up. Because really, how else are you going to stop three circus acrobat jewel thieves who dress like the Devil? When kindly Professor Anderson uses SCIENCE! to send Batman and Robin into the storybook world of "Fairyland" to find his daughter, they end up pitting their detective skills against Father Time, a couple of giants, and a witch named Gruel that Batman defeats by bear-hugging her while she turns into a crocodile. In other words, there&apos;s not a single page of this story that isn&apos;t insane. 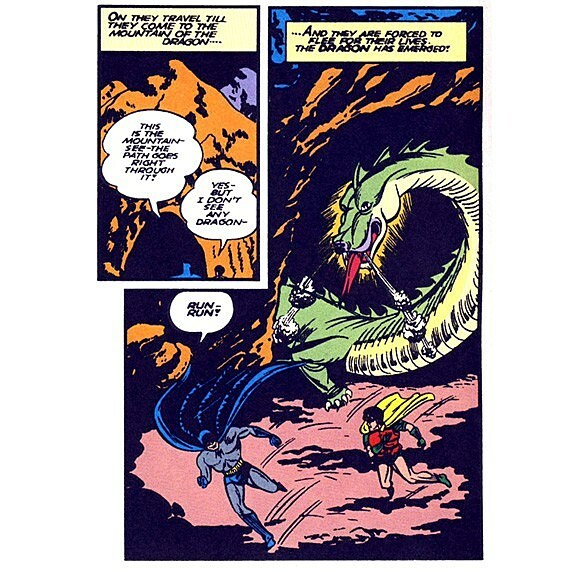 For us, though, the wildest moment is Batman&apos;s reaction when he comes across a dragon, which is neither brave nor bold. C&apos;mon, Batman! It&apos;s just a dragon! Vacationing in the ghost town of Gulch City--because, you know, that&apos; what millionaires did back in the day--Batman runs across a giant statue of a Native American that comes to life and wreaks havoc on the town with the aid of one of roughly eight thousand evil traveling circus gangs that were roaming the country in the Golden Age. 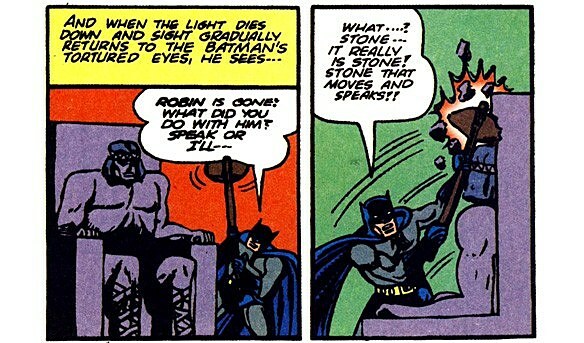 This is, of course, a scam of Scoobydoovian proportions, but the fact that the World&apos;s Greatest Detective can&apos;t figure that out right away and his "interrogation" of a statue make this one more than a little odd. That's the whale that killed his parents.